5 Reasons To Raid Your Mom’s Closet TODAY! There comes a time in a girl’s life where she starts admiring the classic, timeless elegance of her mother’s wardrobe. And while mommy dearest has the best Indian outfits from decades gone by, fusing them with your modern silhouettes creates the perfect definition of #IndiaModern. Here’s 6 reasons why you should be hunting for traditional wear in mom’s closet, pronto! Mom’s silk sarees and suits will always remain the most graceful pieces of clothing you can own. So don’t damage them or throw them away. Keep them in the best of shape and you can always pair them with her classic pearls for the perfect mehendi look. 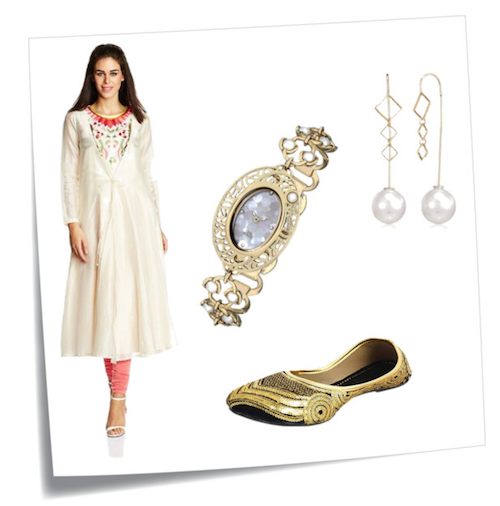 This silk kurta goes perfectly with pearl earrings, jootis and a watch from Amazon Fashion. It might seem highly unlikely, but your mother’s silk sarees go extremely well when paired with contrasting, modern tops from your wardrobe. Mix and match with pieces from her closet for the perfect shaadi look. 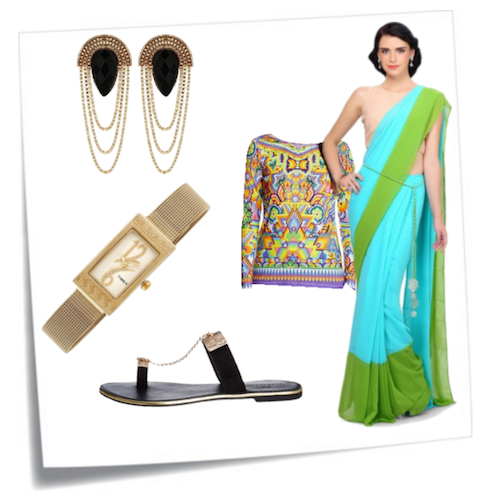 Mix a bright, multicolored top with an elegant saree and accessorize with a watch and earrings. You can always wear flats under your saree to be comfortable through the night. A basic monochrome saree is something most mom’s will own and there’s nothing more flattering than a monochrome saree. You know, when a pre-shaadi cocktail beckons, there’s nothing safer than black, white or both. Pair this pretty drape with with comfy wedge heels, contemporary gold earrings and a black watch to completely steal the show! 4. They Come Back In Vogue… Always! Yes, no matter how out of fashion you might think some pieces in your wardrobe are, they will almost always come back in style. It’s the same case with the outfits in your mom’s wardrobe. Pick up a basic black saree, pair it with an old-school gold strap watch, pretty earrings and kolhapuris for the ultimate sangeet look.